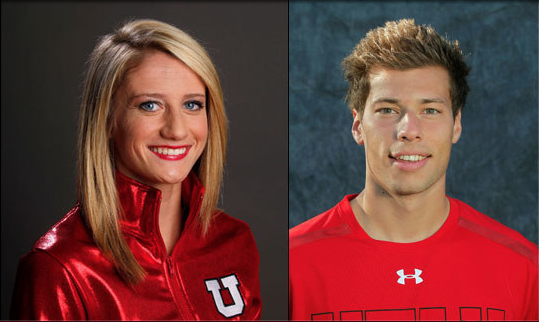 Utah gymnast Mary Beth Lofgren and tennis player Ben Tasevac were announced today as recipients of the prestigious Tom Hansen Conference Medal. A Conference Medal is awarded annually to each Pac-12 member institution’s outstanding senior male and female student-athlete based on the greatest combination of scholarship, athletics and leadership. The 24 Tom Hansen Medal recipients from around the conference will be featured on the Pac-12 Networks’ Pride of the Pac special on Tuesday, July 1 at 8 p.m. MT. Lofgren, a first-team All-American on the balance beam, helped Utah reach the NCAA Championships all four years of her career, including two Super Six appearances. She started on three events (vault, beam and floor) as a senior on Utah’s 2014 Pac-12 Championship team. Lofgren earned 11 victories in her career and hit 94% of her routines as a Ute (121-129). A four-time academic all-conference selection and a NACGC Scholar All-American, Lofgren was also a member of Utah’s Student-Athlete Advisory Committee (SAAC) all four years and she represented Utah at the 2012 Pac-12 SAAC Conference. She earned a bachelor’s degree in health promotion and education with a 3.885 cumulative GPA in May and is applying to nursing school. Tasevac was 48-36 in his Ute career in singles and 25-22 in doubles. He was named Pac-12 Player of the Week on Feb. 25, 2014. His biggest win this season was an upset of No. 55-ranked Maciek Romanowicz of Stanford. As a junior, he twice strung together six-match win streaks and reached the singles quarterfinal round of the Utah Intercollegiate Tournament and the singles round of 64 at the ITA Mountain Regional Championships. During his freshman season, he defeated 24th-ranked Abdullah Hashem of San Diego. Tasevac was a 2013 Intercollegiate Tennis Association Scholar-Athlete and a member of Utah’s SAAC and Student-Athlete Mentor Program. He has a 3.63 cumulative GPA exercise and sport science and is scheduled to graduate in the fall of 2014. This entry was posted in Awards, PAC-12 / NCAA News and tagged Ben Tasevac, Pac-12 Medal, Tom Hansen Medal. Bookmark the permalink.